Wagamama’s home of great Asiatic food. The company recently launched it’s new summer menu and I was lucky enough for them to invite me down to give it a try! I have never been to Wagamama before so I was looking forward to trying their food. Upon arrival I was warmly greeted and offered drinks. 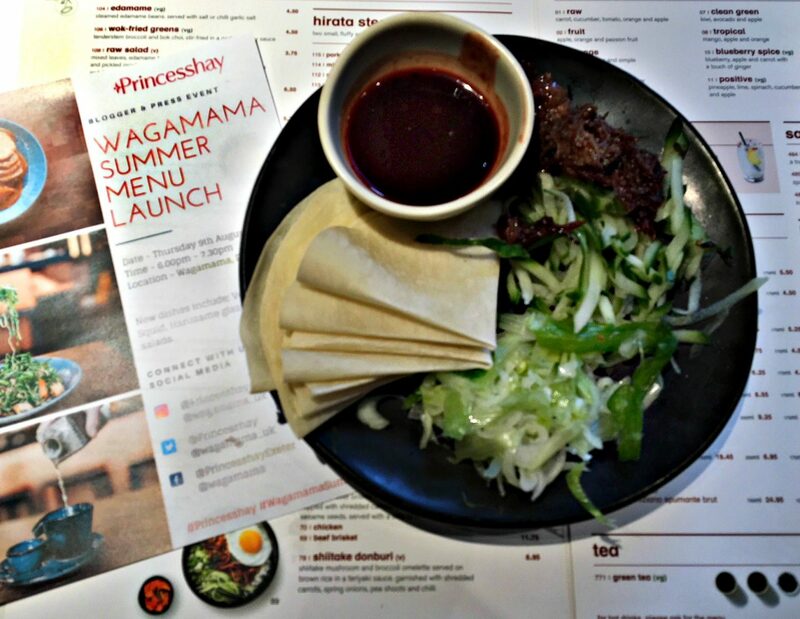 We were then told a little bit about Wagamama and their new menu and what to expect from the evening. Then out came a variety of dishes to sample and it has to be said they looked amazing. The first dish I sampled was the Bang Bang Cauliflower. Cauliflower coated in a firecracker sauce. 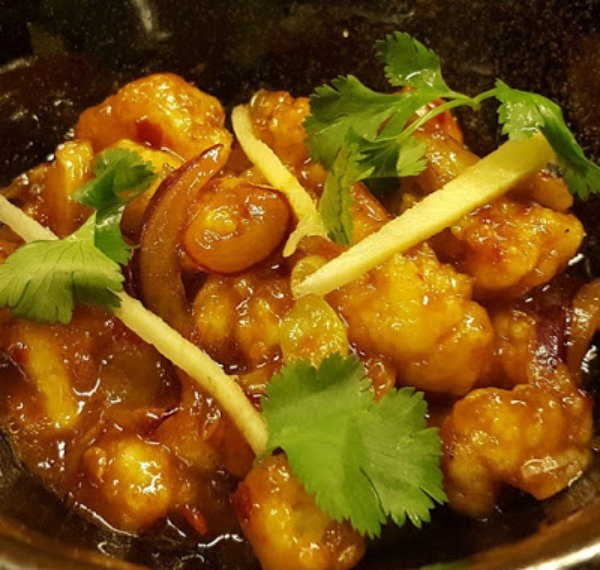 The crispy wok fried Cauliflower is coated in a firecracker sauce. I wasn’t sure what to expect, I am not one for spicy food but I was going to try everything. Surprisingly I enjoyed this side. I wouldn’t be able to eat a lot of it, but what I tried I thoroughly enjoyed. 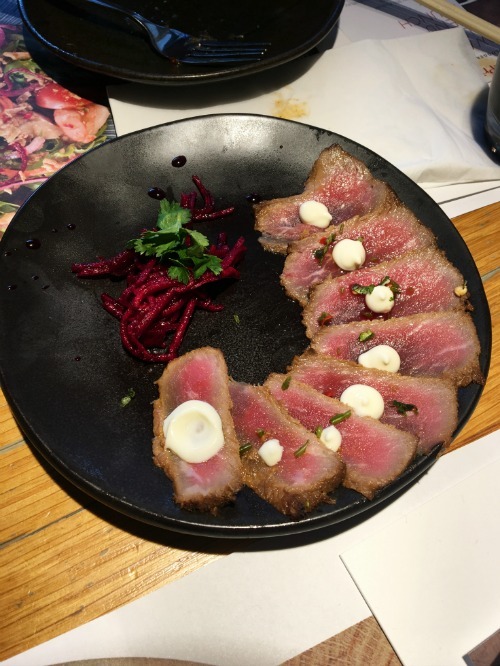 Also bought out to the table was Beef tataki. Lightly seared, marinated steak, thinly sliced and served chilled. dressed with citrus ponzu and mayonnaise. served with a side of pickled beetroot and coriander. I thoroughly enjoyed this side. It was spot on, meaty and delicious. Simple ingredients, punchy flavours and nicely presented. Looking at the menu this it isn’t something I would have thought of ordering, however having tried it I would defiantly order it when I next visit. Next up was the hirata steamed Buns. 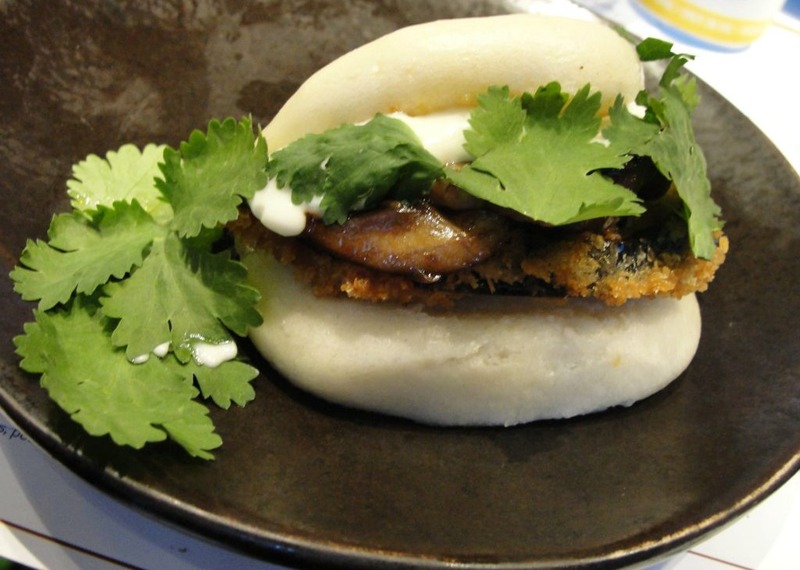 We tried the mixed Mushrooms and Panko Aubergine Hirata Steamed Buns. There are two of the hirata steamed buns on a side, making it the perfect side to share. All I can say about this was wow! These taste absolutely amazing. I didn’t expect to like them as much as I did. The Steamed Buns were so light and fluffy and not to mention, super cute! The presentation like all the sides was perfect. Next we tried the duck wraps. Shredded crispy duck served with cucumber and spring onions served with a cherry hosin sauce. I was excited to try this side as I absolutely love duck. It certainly didn’t disappoint. It was cooked really well, not overcooked, just right. I could happily of eaten loads of these. Defiantly a firm favourite. The next dish that was bought out was one of the new main dishes. Hurasame Glass Noodle Salad. The glass noodles tasted lovely. The salad is the perfect dish for a hot summers day. I was feeling rather full after sampling all of those wonderful dishes. So imagine my reaction when they then said we could order a main meal of our choice! As I haven’t been to Wagamama before I had no idea what to choose. I decided to order the Chicken and Prawn Pad Thai based on other people’s recommendations. 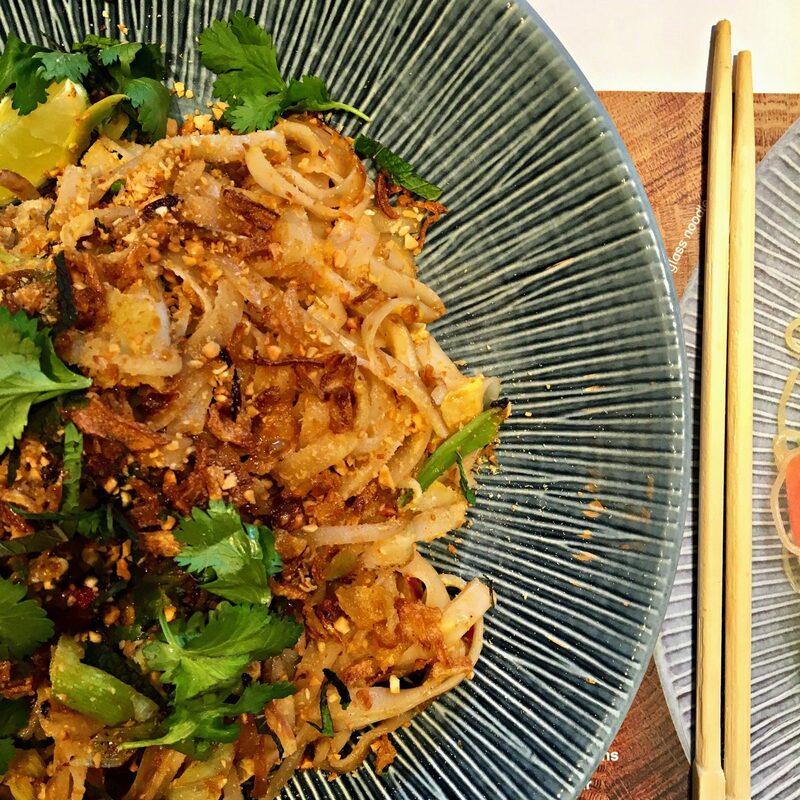 The Pad Thai is rice noodles in an amai sauce with egg, beansprouts, leeks, chilli and red and spring onions. garnished with fried shallots, peanuts, mint, coriander and fresh lime. As I have mentioned before I am not very good with spicy food. The Pad Thai is very tasty and flavoursome until I took a mouth full with chilli’s. Wow, that has a kick. After that I struggled to eat much more. Our lovely hostess Dorota suggested I try something else and she bought out a chicken and prawn Yaki Soda. I really enjoyed it and would definitely order it again. The evening at Wagamama in Exeter was really enjoyable and the food was lovely. I will definitely be visiting again at some point in the future. 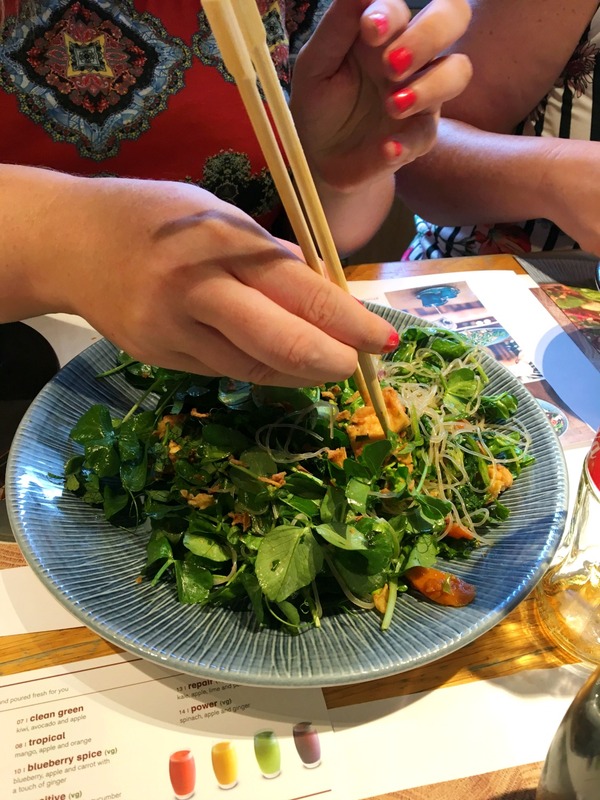 The new additions to the menu are super tasty and I recommend popping along to your local Wagamama to try them for yourself. 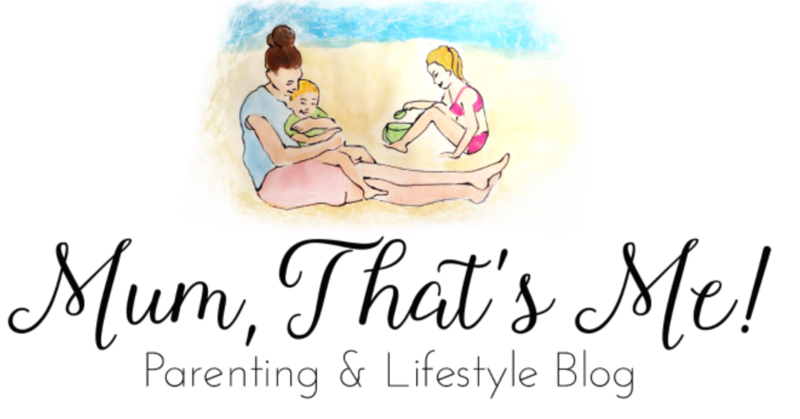 Disclaimer – The tasty food I sampled was part of a blog event. 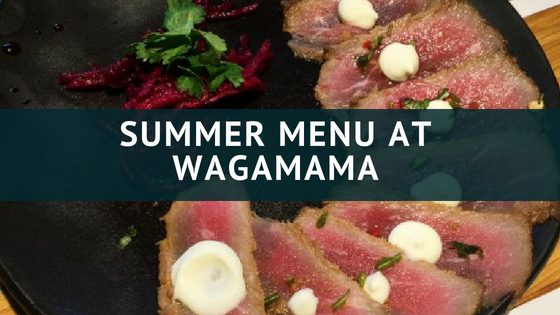 I already love Wagamamas so loved hearing about their summer menu – you’ve made me want to go this weekend and check it out! I love the sound of the steamed buns! MMM. That beef looks yummy and the duck!! Would definitely order those! !